Selangor is Malaysia's most populated state, and ranks next to Penang in having the highest per capita GDP. It completely surrounds the federal territories of the nation's capital, Kuala Lumpur, and the new administrative capital, Putrajaya. Selangor is Malaysia's most developed state, and has impressive infrastructure and industrial zones. The economically diverse state also produces rubber and oil palm, and has a significant number of tin mines in the Klang Valley. Selangor is also home to the Kuala Lumpur International Airport in Sepang and Port Klang, Malaysia's largest port. Not far from Kuala Lumpur is Petaling Jaya, a master-planned modern city centred on commercial and industrial activities. It is a hub of shopping and nightlife. Selangor was initially ruled by the Sultanate of Malacca, until the Portuguese conquered Malacca in 1511. Its earliest settlers were the Minangkabau people from Sumatra, who were later driven out. With the discovery of massive tin reserves, the state was overrun by foreign conquerors. In the 17th century the Dutch encouraged the influx of the Malay Bugis, from Celebes, who drove out the Sumatrans and established a sultanate in 1740. Many Chinese immigrants arrived in the 18th century and fought often with other locals, until the British intervened and formed the Federated Malay States. Selangor became independent in 1957, but ceded Kuala Lumpur's territory to the federation in 1970. The state capital is Shah Alam, which grew in size when the first Proton manufacturing plant was built here. The capital also boasts of the only "agroforestry" park in the world, the Malaysia Agriculture Park, which features the agricultural methods used in the country. 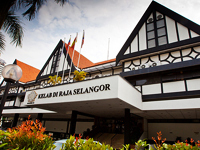 The state's royal capital is the town of Klang in the Klang Valley. High-rise buildings abound. Selangor offers some of the best shopping in Malaysia, and has much variety, from night markets to modern malls. The state also has elegant fine dining, and street hawkers with cheap yet delicious native fare. The state has almost 40 golf courses, one of the most exclusive being Saujana, a former oil palm plantation. Car racing is a favourite spectator sport here, and the Sepang International Circuit regularly holds local and global championships. Bird-watching, jungle trekking and camping can be done at the Kuala Selangor Nature Park, and for an unusual and breathtaking recreation, Kampung Kuantan offers trips for watching fireflies light up the mangrove swamp.